An interstate highway is any highway built under the auspices of the Federal Aid Highway Act of 1956 and funded by the federal government. The idea for interstate highways came from Dwight D. Eisenhower after he saw the benefits of the Autobahn during wartime Germany. There are now over 42,000 miles of interstate highways in the United States. On July 7, 1919, a young army captain named Dwight David Eisenhower joined 294 other members of the army and departed from Washington D.C. in the military's first automobile caravan across the country. Due to poor roads and highways, the caravan averaged five miles per hour and took 62 days to reach Union Square in San Francisco. At the end of World War II, General Dwight David Eisenhower surveyed the war damage to Germany and was impressed by the durability of the Autobahn. While a single bomb could make a train route useless, Germany's wide and modern highways could often be used immediately after being bombed because it was difficult to destroy such a wide swath of concrete or asphalt. These two experiences helped show President Eisenhower the importance of efficient highways. In the 1950s, America was frightened of nuclear attack by the Soviet Union (people were even building bomb shelters at home). It was thought that a modern interstate highway system could provide citizens with evacuation routes from the cities and would also allow the rapid movement of military equipment across the country. Within a year after Eisenhower became President in 1953, he began to push for a system of interstate highways across the United States. Although federal highways covered many areas of the country, the interstate highway plan would create 42,000 miles of limited-access and very modern highways. Eisenhower and his staff worked for two years to get the world's largest public works project approved by Congress. On June 29, 1956, the Federal Aid Highway Act (FAHA) of 1956 was signed and the Interstates, as they would be known, began to spread across the landscape. The FAHA provided for federal funding of 90% of the cost of the Interstates, with the state contributing the remaining 10%. The standards for the Interstate Highways were highly regulated—lanes were required to be twelve feet wide, shoulders were ten feet wide, a minimum of fourteen feet of clearance under each bridge was required, grades had to be less than 3%, and the highway had to be designed for travel at 70 miles per hour. However, one of the most important aspects of the Interstate Highways was their limited access. 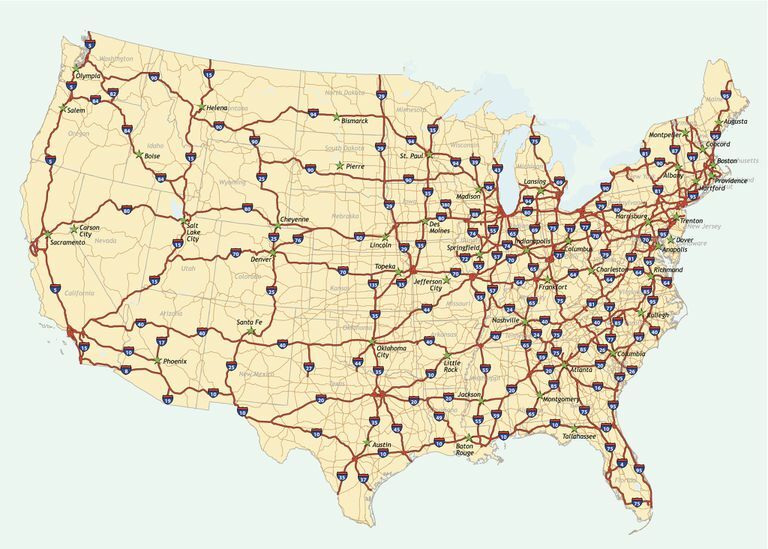 Although prior federal or state highways allowed, for the most part, any road to be connected to the highway, the Interstate Highways only allowed access from a limited number of controlled interchanges. With over 42,000 miles of Interstate Highways, there were to be only 16,000 interchanges—less than one for every two miles of road. That was just an average; in some rural areas, there are dozens of miles between interchanges. Less than five months after the FAHA of 1956 was signed, the first stretch of Interstate opened in Topeka, Kansas. The eight-mile piece of highway opened on November 14, 1956. The plan for the Interstate Highway system was to complete all 42,000 miles within 16 years (by 1972.) Actually, it took 27 years to complete the system. The last link, Interstate 105 in Los Angeles, was not completed until 1993. In 1957, the red, white, and blue shield symbol for the Interstates' numbering system was developed. Two-digit Interstate Highways are numbered according to direction and location. Highways running north-south are odd numbered while highways running east-west are even numbered. The lowest numbers are in the west and in the south. Three-digit Interstate Highway numbers represent beltways or loops, attached to a primary Interstate Highway (represented by the last two numbers of the beltway's number). Washington D.C.'s beltway is numbered 495 because its parent highway is I-95. In the late 1950s, the signs displaying white lettering on a green background were made official. Specific motorist-testers drove along a special stretch of highway and voted on which color was their favorite—15% liked white on black, 27% liked white on blue, but 58% liked white on green best. Although Alaska has no Interstate Highways, Hawaii does. Since any highway built under the auspices of the Federal Aid Highway Act of 1956 and funded by the federal government is called an interstate highway, a highway does not have to cross state lines to count as one. In fact, there are many local routes that lie entirely within a single state funded by the Act. For example, on the island of Oahu are the Interstates H1, H2, and H3, which connect important military facilities on the island. Some people believe that one mile out of every five on interstate highways is straight to serve as emergency airplane landing strips. 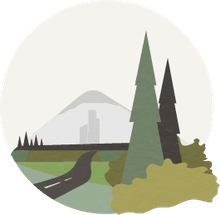 According to Richard F. Weingroff, who works in the Federal Highway Administration's Office of Infrastructure, "No law, regulation, policy, or sliver of red tape requires that one out of five miles of the Interstate Highway System must be straight." Weingroff says that it's a complete hoax and urban legend that the Eisenhower Interstate Highway System requires that one mile in every five must be straight to be usable as airstrips in times of war or other emergencies. Besides, there are more overpasses and interchanges than there are miles in the system, so even if there were straight miles, planes attempting to land would quickly encounter an overpass on their runway. The Interstate Highways that were created to help protect and defend the United States of America were also to be used for commerce and travel. Though no one could have predicted it, the Interstate Highway was a major impetus for in the development of suburbanization and sprawl of U.S. cities. While Eisenhower never desired the Interstates to pass through or reach into the major cities of the U.S., it happened, and along with the Interstates came the problems of congestion, smog, automobile dependency, drop in densities of urban areas, the decline of mass transit, and others. Can the damage produced by the Interstates be reversed? A great deal of change would be needed to bring it about. How Did the First American Highway Come About? Do Highway Miles or City Miles Help Prolong a Car's Life?